José Neves started his first business aged just 19, creating software for business in the North of Portugal. His family had a history in shoemaking, and it was perhaps inevitable that fashion would play a role in his career – but few could have predicted the decade long-journey, beginning in the depths of the global financial recession, that would see José take the idea for a luxury fashion eCommerce marketplace and build it into Farfetch; a business with close to 3,000 employees, 3m customers, almost U$1bn in listed merchandise, and a market capitalisation approaching U$6bn – making José a billionaire in well-under 10 years from a standing start. I caught up with José to learn more about his entrepreneurship journey, and building a global luxury brands business. José Neves: I think the entrepreneurial spirit was always in me. When I was eight, I was given a computer for Christmas. It came with no video games, just a programming manual. I started coding and found my first passion: creating software. In 1993, when I was 19, I started my first business. It was a “software house,” creating software for businesses and, being from the North of Portugal and a family with a history of shoemaking, fashion companies naturally became my clients. That’s when I found my second passion: fashion. Eventually, I became a shoe designer, a boutique owner, a tradeshow organiser, a bit of everything in fashion. I fell in love with the industry – I was swept away by its people, places, chaotic creativity. Fashion is all about craftsmanship, creativity and great design. It celebrates beauty in every form. But it’s not art. It’s supposed to be worn, but more than that, as you wear it, it changes the way you feel that day and helps you to project how you want the world to see you. Q: What was the seed that created the idea for Farfetch? José Neves: I dreamt of Farfetch for the love of fashion. I was absolutely determined to create something in the intersection of both fashion and tech – my two passions. I was thinking about what I could develop to help the fashion industry leverage technology. I think the idea really came when I was in my showroom in Paris during fashion week and I could see all these boutiques who were just not going to survive as the internet and e-commerce really started to change the fashion industry – they weren’t going to benefit from the change as they didn’t have the capital or capabilities to do so. That’s when I had the idea that we should build a platform for the luxury fashion industry, a platform where all these amazing boutiques could benefit from a new global audience for their curated fashion. Q: What are the key challenges of launching a retail eCommerce business? José Neves: For us the challenges were unique to what we were trying to achieve. Once we had the idea the first thing was to come up with a simple but effective execution plan. Our technology had to be proprietary, it was going to be the main tenet of our business; to connect inventory from disparate stock points in real time that the customer can pay for in one easy check out. Then I focused on how to make this an amazing consumer proposition, it started with our boutique partners, we had to have the best curation of fashion. One of the biggest challenges for us was getting the marketplace dynamics working; supply needs demand, and vice versa. We launched with 25 boutiques and through their curation immediately had an incredible fashion offering of around 300 different brands, so then we had to ensure customers came to our platform and had the opportunity to find this amazing fashion. Q: How have luxury brands adapted to the eCommerce market? José Neves: According to Bain, the online share of the global personal luxury goods market in 2017 was approximately 9%, significantly lower than other retail markets. This has been driven by luxury brands’ cautious approach to adopting technology and social platforms. However, online sales are expected to become a larger percentage of the total market, reaching 25% by 2025, according to Bain. I fell in love with the fashion industry, the products, how international it was, and the people; especially in small family-run businesses. Slowly, over the course of a decade, we built relationships by proving we weren’t there to destroy luxury’s heritage and its “unspoken codes of conduct,” but actually to protect them and enable this industry to thrive. We were fashion insiders, and we just happened to be coders too! Every player in this eco system needs each other. The boutiques are unique in that they discover and nurture emerging talent, the big brands keep an eye on these amazing curators of fashion too. Q: What is the role of eCommerce in such service-centric markets such as retail luxury? José Neves: We believe the future of luxury fashion retail will be defined by the reinvention of the consumer experience by connecting the online and offline retail worlds. We have developed, and continue to evolve, a suite of connected in-store technologies to provide a digitally enabled, personalized physical shopping experience. The first example of our Augmented Retail strategy is Farfetch Store of the Future, a suite of technologies that aims to improve retail productivity by capturing consumer data and enhancing interactions between consumers and sales associates, both in store and when the consumer interacts with the retailer or brand offline. We believe the future of luxury fashion retail will be defined by the reinvention of the consumer experience through online and offline integrations, and we are investing in innovation to achieve this vision. Store of the Future, is all about a seamless convergence of mono-brand, multi-brand, online and offline, delivering amazing user experiences in all touchpoints with the consumer. Q: How can we defend brand equity and provenance in a digital landscape? José Neves: There is something magical about the physical retail experience. As a boutique owner 20 years ago, I discovered the interior design, the scents, the ability to touch the fabric and try on the clothes and, most importantly, the human touch and storytelling that digital will never completely replace. Today’s digital-first customers have, however, been exposed to ultra-personalised experiences. Our favourite apps and internet companies know us, our preferences and give us an experience that is truly personalised. It is what consumers expect and demand. Offline retailers know nothing about us and learn nothing about us when we come in and after we leave. This will not last long, and we foresee a revolution in retail, powered by ultra-personalisation via digital technologies. In this way technology should be leveraged to enhance the physical and human experience, not replace it. Q: How do you defend market share and custom in a market with such low barriers to entry? José Neves: Actually, luxury fashion has relatively high barriers to entry, The luxury industry is built on heritage, craftsmanship and relationships – we have spent a decade building those relationships and nurturing and caring for the brands’ heritage, Additionally, the size of the opportunity is far larger than what Farfetch is today. As Bain has noted, the online share of the global personal luxury goods market in 2017 was approximately 9%, significantly lower than other retail markets, and it’s set to be 25% by 2025. We believe the 75% of sales still happening in physical retail in ten years will be revolutionised by digital technologies. In fact, the distinction between offline and online retail will vanish, as consumers will not be able to tell where one started and the other finished. This is what we call at Farfetch “Augmented Retail”. We have been working on technologies, including Farfetch Store of the Future, which will help to bring the online and offline retail worlds together. Q: What have been your greatest entrepreneurship learnings from leading a rapidly scaling business? José Neves: Continue to innovate and create offers for your market that no-one else can. Google is a huge source of inspiration. They’ve optimized the core business, which is advertising, but they do not give up on funding constant moonshots. One of the greatest lessons I’ve learned is about culture and values – the culture of a business exists from day one and it really comes from the founder and founding team, once the company gets bigger though you need to verbalise and document the company culture so it was clear to everyone and became a mantra. Everything changes when you’ve hired around 150 people and we now have over 3000. When we first launched, my job was about finding amazing boutiques, working with the developers to create a product or designing solutions, finding customers. My job now is really about leadership, culture, values and being the ambassador for our business and what we are trying to achieve, as well as of course managing investors. It’s a very different job to when I launched Farfetch but I’m still loving it and am very grateful to the team. Q: What have been your key learnings about fundraising from your experiences? José Neves: You have to be resilient and you have to find the right investors. Surround yourself with amazing investors who are experts. Q: What are the critical investment areas for you, within your business? José Neves: We will continue to invest in people, product and infrastructure to drive technological innovation in the luxury industry. This includes continuing to enhance our Marketplace for all participants through the application of data science and machine-learning technologies to facilitate further personalization and inspiring moments for consumers. We will also continue to grow Farfetch Black & White and further develop and monetize Farfetch Store of the Future. We aim to continue to be the innovation partner of choice for the luxury industry, developing new ways for the fashion ecosystem to evolve..
Q: How do you remain resilient and driven as a business owner? José Neves: I start every day with exercise and focus. I have a routine which I stick to which includes things like meditation, time with family and exercise, I like to get back to nature and tend to run in the park. Q: What is the role of inspiration and mentorship in your career? José Neves: When I started programming I followed Bill Gates and Steve Jobs and it caught my imagination – I wondered what it would be like to run a company that was going to change the world as their companies have. Q: What would be your message to the next generation of entrepreneurs? 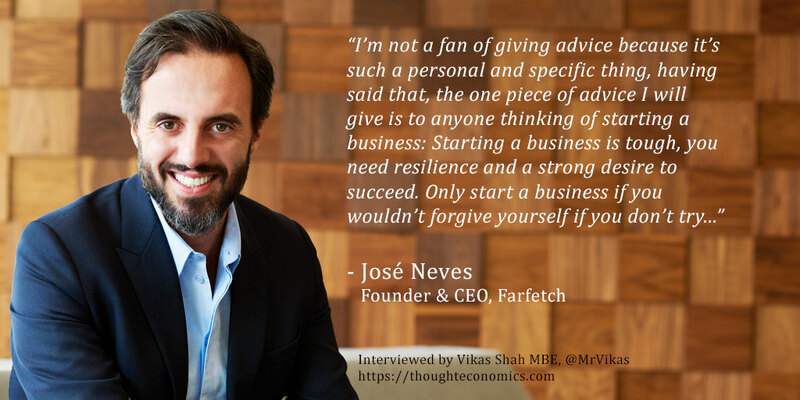 José Neves: I’m not a fan of giving advice because it’s such a personal and specific thing, having said that, the one piece of advice I will give is to anyone thinking of starting a business: Starting a business is tough, you need resilience and a strong desire to succeed. Only start a business if you wouldn’t forgive yourself if you don’t try.